An apple and molasses flavored 100% psyllium pellet with high swell volume to help encapsulate and remove sand and dirt from the intestinal tract. 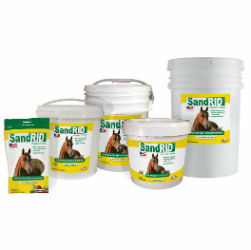 It supports healthy gut function to help reduce the possibility of sand colic. Horses love the apple and molasses flavor. Pelleted and easy to feed as a top dress or fed alone. ADULT HORSE (1,000 lbs. ): Administer 1 to 1.5 scoops daily for one full week (7 days) out of every month. Give less to ponies, yearlings and foals; more to larger horses and draft breeds. Can be given during or after meal time. Scoop included equals 5.2 ounces.